SolarEdge Technologies, Inc. (“SolarEdge”) (NASDAQ: SEDG), a global leader in PV inverters, power optimizers, and module-level monitoring services, wins the prestigious Intersolar Award in the Photovoltaics category for its HD-Wave technology inverter. Representing one of the most significant leaps in solar technology in the past 20 years, SolarEdge’s HD-Wave inverter technology is a novel power conversion topology that significantly decreases inverter size and weight while achieving record efficiency. By employing distributed switching and advanced digital processing to synthesize a clean, high-definition sine wave, HD-Wave inverters have <1/2 the heat dissipation, 16x less magnetics, and 2.5x less cooling components than current SolarEdge inverters, which are already among the smallest on the market. Inverters powered by HD-Wave technology are ≤6kW, 14.5L, ≤9.5kg and have 99% weighted efficiency. The HD-Wave technology inverter is already available in select locations. SolarEdge plans for a more extensive rollout throughout 2016. 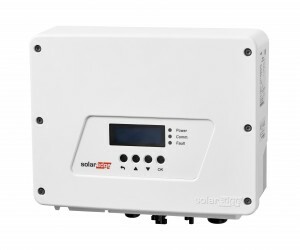 Along with its extended portfolio of smart energy management solutions and its commercial offering, SolarEdge is displaying its HD-Wave technology inverter at its booth, located in Hall B3, Booth 110 during Intersolar EU.